TUMWATER, Wash. – Matt Stalnik’s hat trick and a pair of goals from both Greg Wolfe and Nate Salveson led the Oly Town Artesians to the first win in franchise history, a 10-8 victory over the Wenatchee Fire on Saturday night at Olympia Indoor Soccer. In a brutal first fifteen minutes that saw four blue cards issued to the two teams, Matt Stalnik started the scoring for the Artesians midway through the first quarter with a power play goal on an assist by Luke Chouinard. Minutes later, on another power play, the Wenatchee Fire got on the board thanks to a Josh Alvarez goal with 5:15 left in the quarter. The two teams went to the first break knotted up at one. But the floodgates opened in a wild second quarter that saw 10 goals scored. Stalnik started it off again with a screamer that found the back of the net with just 50 seconds gone in the period. But Wenatchee would take their only lead of the game behind goals by Matthew Stefanko at the 13:30 mark and another goal by Alvarez with 12:20 left in the quarter. Down 3-2, the Artesians went on a four goal run to take the lead for good. Nate Salveson started the run with a goal off of a free kick with 10:37 left in the second quarter. Greg Wolfe scored at the 7:40 mark and less than a minute later, Martin Ramirez got on the score sheet to put the Artesians up 5-3. Wolfe scored again on a pass off the boards from Salveson to extend the Artesians lead to 6-4. Juan Barboza scored a power play goal for the Fire at the 2:13 mark of the second and then Oly and Wenatchee traded goals in the final minute, the first an Artesians goal by Salveson. Then Wenatchee’s Alex Espinoza finally finished off a crazy second quarter with 23 seconds left and Oly went to the locker room with a 7-5 lead. Once again, Stalnik started the scoring with a goal in the first minute of the period off an assist by Ramirez to put the Artesians up 8-4. Wenatchee answered back with a goal by Yonathan Rodriguez with 11 minutes left in the third but Mike Rancipher and Brady Espinoza each tallied the only other goals of the quarter and Oly took a 10-6 lead into the fourth quarter. Goals by Mauricio Perez and Hernan Menoza got the Fire to within two with eight minutes left but Artesians goalkeeper Mauricio Sanchez made amazing save after amazing save the rest of the way and Oly held on 10-8 for their first ever franchise victory. Sanchez finished the night with 23 saves and was fantastic between the pipes despite the eight goals against. 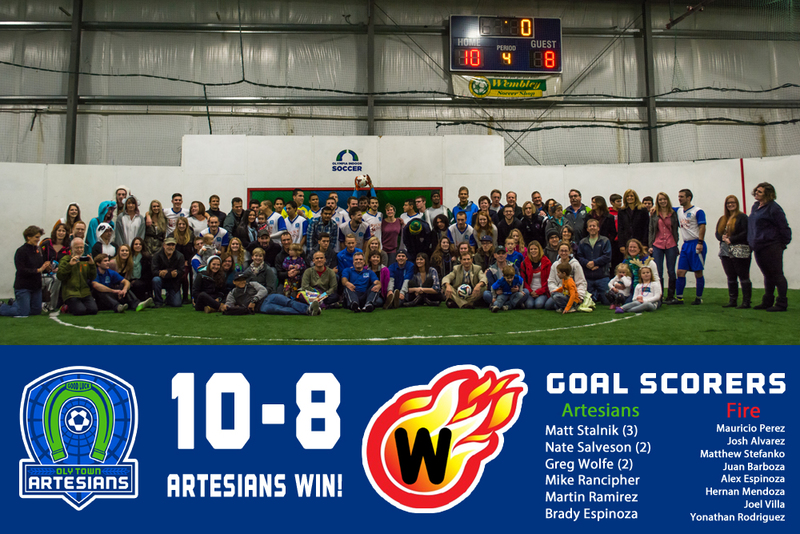 The Artesians moved to 1-1-0 (3 points) while the Wenatchee Fire dropped to 1-1-1 (4 points). Oly Town takes their first road trip of the season when they visit the Arlington Aviators on Saturday, December 13th while Wenatchee plays host to first place Tacoma.